INTI Malaysia today unveiled INTI International College Kuala Lumpur (IICKL) – its brand new campus in the heart of the golden triangle aimed at meeting a market need for high quality programmes that cater to the needs of working professionals and undergraduates alike. A RM10 million investment backed by even stronger industry collaboration in the delivery of the programmes is expected to raise the bar in the higher education sector. 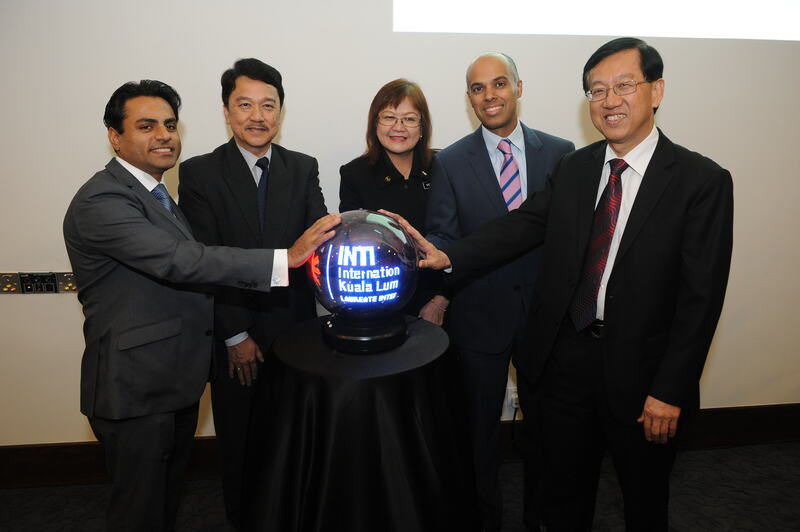 Rohit Sharma, Chief Operating Officer, INTI; Jeffrey Goh, Chief Executive, IICKL; Datuk Mary Yap, Deputy Minister 1, Ministry of Education Malaysia; Amit Sevak, CEO, INTI; and Tan Yew Sing, Chairman, INTI launch INTI International College Kuala Lumpur. The strategically located campus in Menara KH, Jalan Sultan Ismail, is easily accessible by road and public transport and will offer a suite of new business programmes at certificate, diploma, bachelor’s and master’s degree levels, with intakes beginning in August 2013. These include business degree courses in Accounting, Accounting & Finance, Business Administration and Finance, which are designed in collaboration with the UK’s University of Hertfordshire (UH). The Accounting & Finance degree allows exemptions from professional bodies such as ACCA and CIMA upon completion of the programme. The University of Hertfordshire is among the top 4% of Universities in the World as per the World University Ranking conducted by QS Annual World University Ranking. UH was selected as one of the world’s top 100 universities aged under 50 by Times Higher Education (THE). The rankings are based on excellence across teaching, research, citations, industry income and international outlook. IICKL will also launch a new Master of Business Administration (MBA) programme offered in collaboration with Sydney Business School (SBS). The SBS MBA is ranked the No. 1 MBA in Australia by The London-based International Graduate Forum (IGF). Additionally, SBS is ranked among the top 3 business schools in Australia and top 200 business schools in the world. A unique point about the SBS MBA at IICKL is that lecturers from SBS in Australia will deliver at least 6 out of the 12 modules in Kuala Lumpur. Additionally, local tutors with PhD qualification will provide tutorial support to all students. MBA students will also attend 6 (Six) special “Master classes” delivered by SBS lecturers/local industry experts for a range of topics which address contemporary business issues such as Corporate Social Responsibility, Innovation, Entrepreneurship, Supply Chain Management, Business Risk, and Change Management. Greater industry-academia partnership is one of the key strengths of the new campus. Apart from brand new facilities and programmes for individual learners, IICKL will offer companies across industries the opportunity to collaborate on graduate/employee talent development. IICKL will engage industry via INTI Corporate Partner Programme (ICP), an initiative that benefits companies in the areas of staff engagement and retention, including training and development. Participating companies will play an anchor role in the design and delivery of programmes relevant to industry by participating in activities such as presentations by guest speakers, part-time teaching by practicing professionals, “Lunch n’ Learn” programme preview sessions for employees, and more. Their staff will enjoy exclusive rebates on tuition fees for IICKL programmes. Catered to working professionals as well as regular students, IICKL has an initial capacity for 2,000 students with an option to expand up to 4,000 students, and amenities include a new 85-seat auditorium that serves as an impressive venue for presentations by local and international speakers as well as ample learning spaces. It also houses an iMac room within a spacious library. Blended learning at IICKL incorporates lectures and innovative technologies that include online tools, multimedia content and Blackboard’s learning system. Innovation brings multiple industry projects that enable students to work with employers on real business issues and solutions to gain experience and readiness for global employability. “The launch of this fabulous new INTI campus in downtown KL provides a professional and unique learning platform that provides both traditional students and working professionals with access to first rate programmes, innovation in the classroom and top notch faculty. Our goal is to transform the education experience in KL and across Malaysia and we believe we have the right formula in this new offering,” said Amit Sevak, CEO of INTI International University and Colleges. For more information on IICKL and its programmes please call 03-2052 2888.